Der CDU-Vorsitzende, Bundeskanzler Helmut Kohl, legt während des CDU-Parteitags am 28. 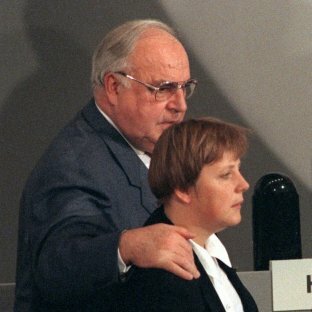 November 1994 in Bonn den Arm um seine Stellvertreterin Angela Merkel. This entry was posted on Sunday, August 8th, 2010	at 10:51 pm	and is filed under Uncategorized	. You can follow any responses to this entry through the RSS 2.0	feed. You can leave a response, or trackback from your own site.